I find nature truly enchanting. 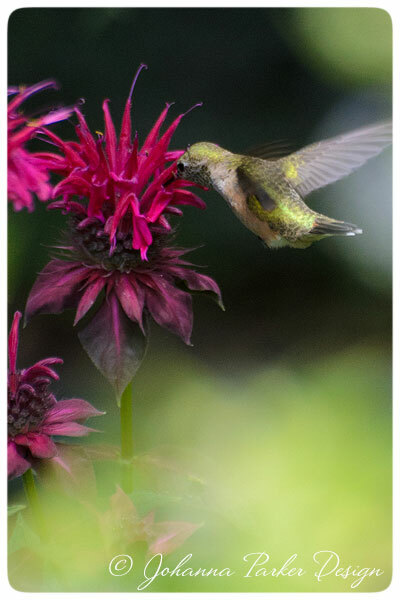 From the smallest of winged visitors, sampling the nectar and pollen of blooming flowers to the beautiful patterns and textures of the plants that grow, it's all magic to me! To capture these creatures in motion, senses must be alert as their visits are often fleeting. 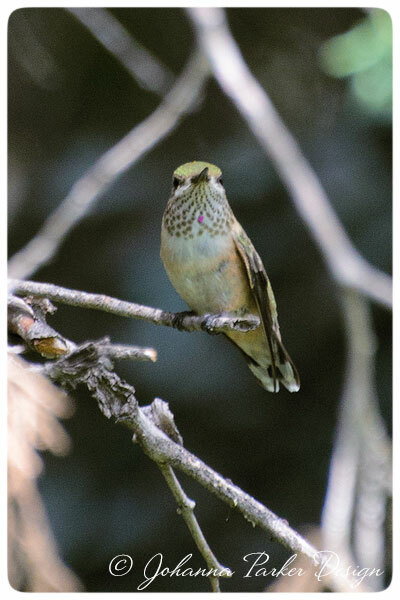 I listen for the sounds of the birds and insects, and I try to identify who's call is whose. 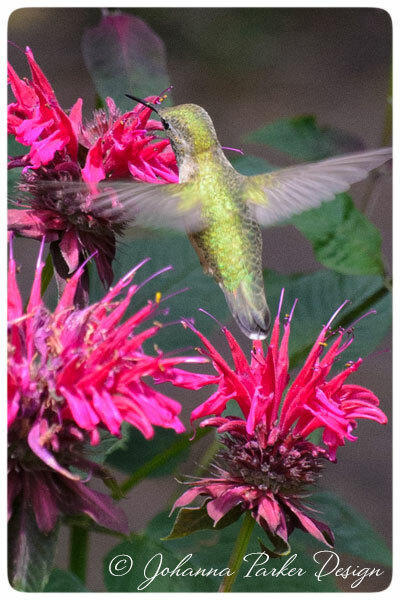 Yesterday, the high-pitched chirp of the hummingbird stopped me in my tracks. 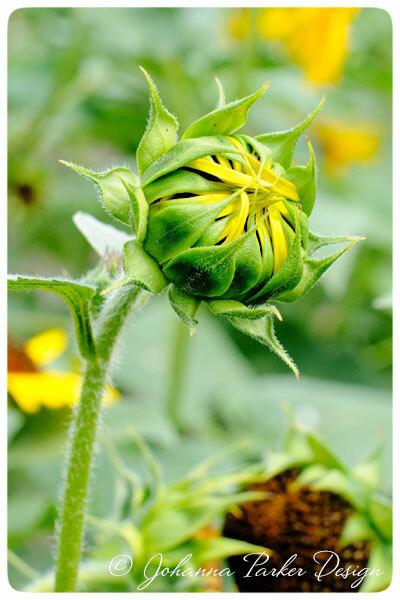 I rushed inside, snatched the zoom lens and tiptoed out to the garden. 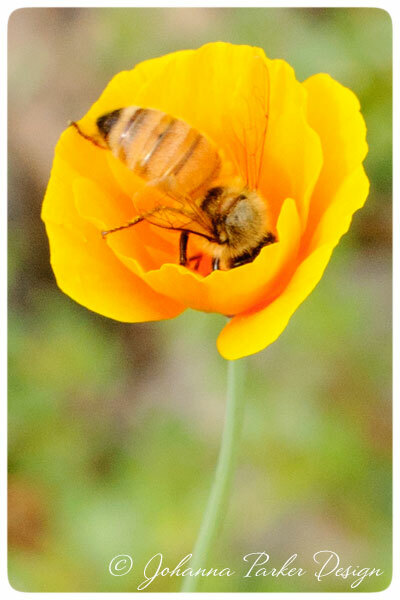 I absolutely adore these little creatures and rarely catch a glimpse in time before they buzz away. 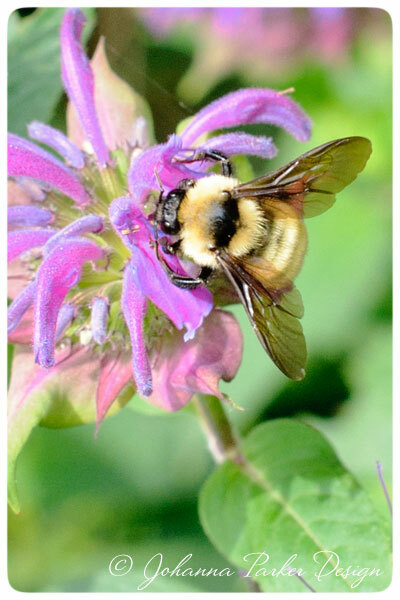 Luckily, this day, I was fortunate and captured a little darling, savoring our magenta bee balm's blooms. 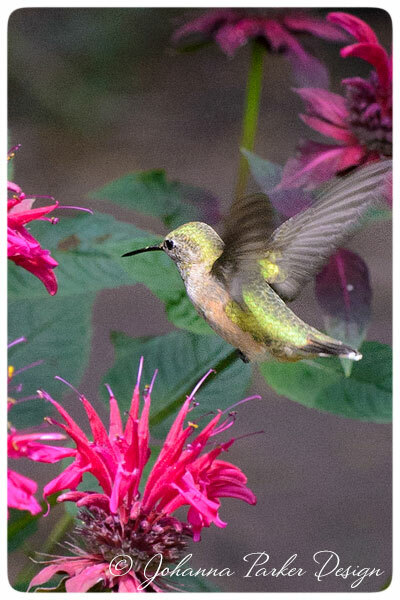 It's the first moment thatI have ever snapped a single photo of a sweet hummer, and I wanted to share the multitude of images I captured! 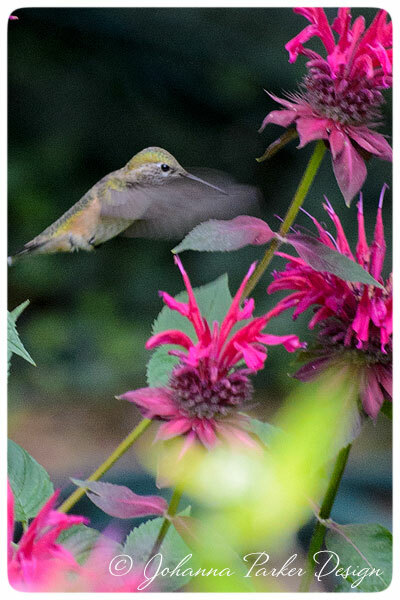 After he buzzed away, I found more enchanting subjects to photograph. 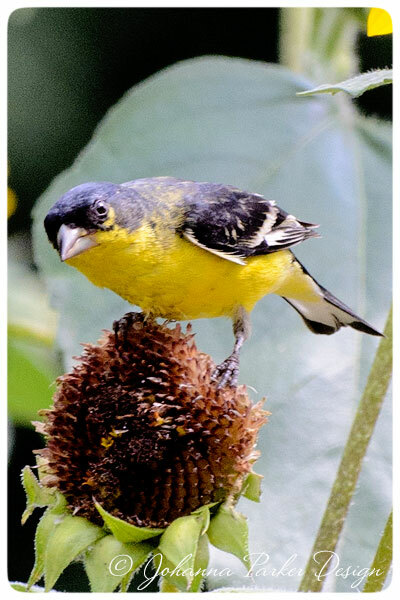 Like a web, each character is delicately interwoven with the other, and we as humans participate in the magic of the story by planting flowers that attract and feed these little guys. And rather than cutting those plants down as they fade, we allow nature to play out its course as you will see below.... Enjoy! 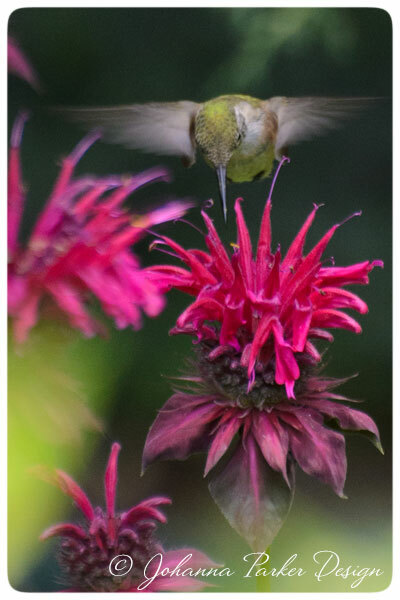 * As he visits a bee balm blossom, he hovers mid-air, flapping his wings up to 80 times per second!...How amazing is that?! 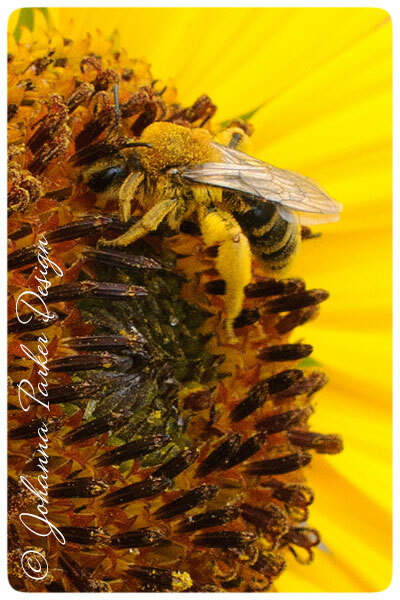 * And another type of bee with fuzzy, fat yellow legs was feasting on this sunflower.... At a glance, I spotted 4 distinct types of bees during that short interval of time in our garden. 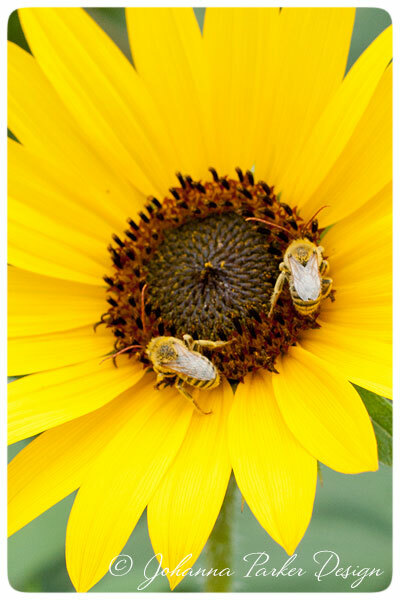 But according to an online search, there are over 20,000 species of bees in the world! Wow! 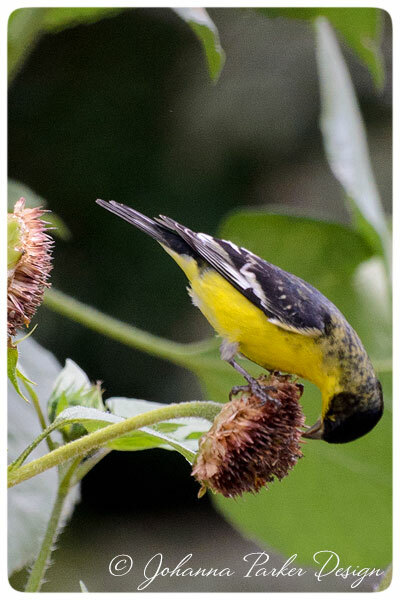 * I hid behind our vine-covered trellis and captured several shots of this Lesser Goldfinch with a zoom lens. 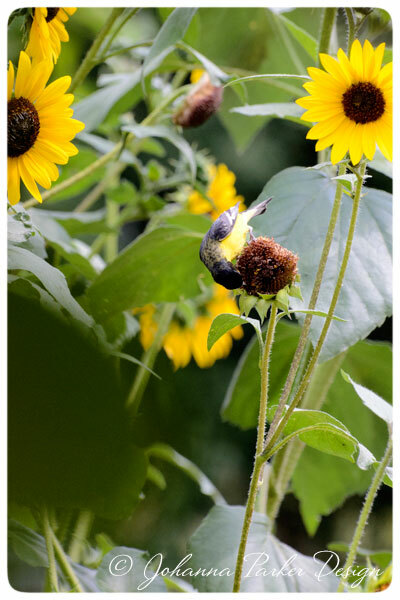 These guys started visiting our yard, after our sunflowers became a perennial part of our garden landscape. 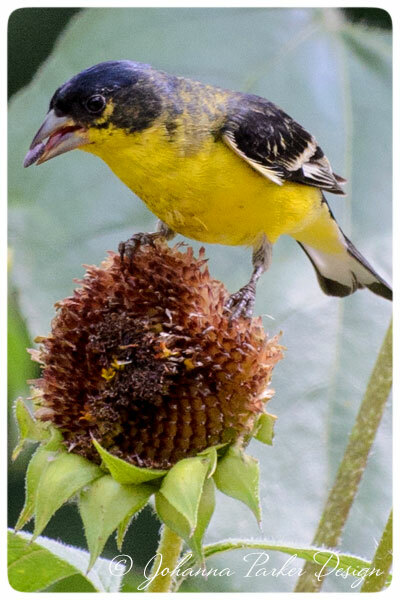 * This guy perches on a spent seed head and plucks out each sunflower seed. Years ago, mindless of my surroundings, I would have cut these old flowers down after their petals dropped. But, now it's such a joy to see the cycles of nature, to offer food to these delightful little characters who add whimsy and motion to the landscape. * And it's fun to imagine little stories about each character. 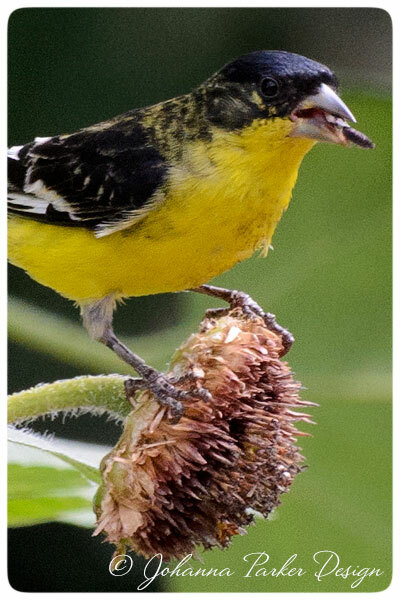 This guy looks like he's striking a pose while smoking his cigar..... hehe! * And who else did I spot in the garden?..... 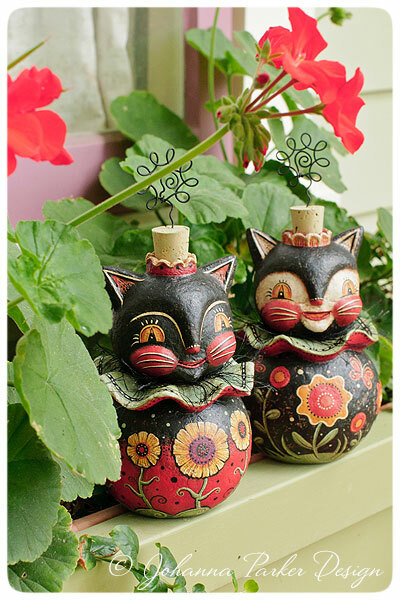 A pair of flower-themed kitties were nestled atop our geranium-filled window box! They like to explore the magic of nature too..... Actually, I created these characters, inspired by details that delight me in my garden. The two are a special order for a therapist who loves my art and who works with children. Her request for these characters was so compelling, that I could not resist making them. 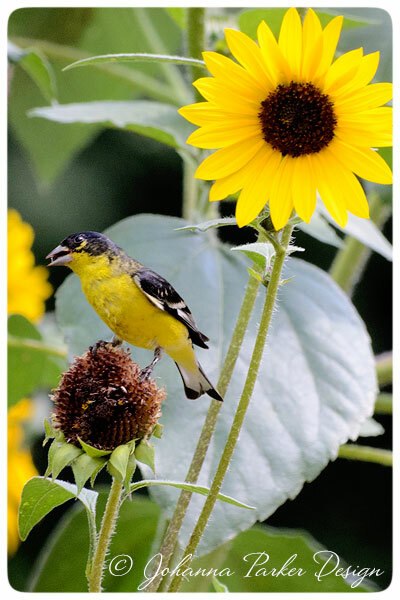 Now, "Petals Pete" and "Garden Gertie" are on a mission to spread joy and smiles to her little patients in New York.... And hence, that intricate web of life continues to connect us all together through the magic of nature. May you have reverence for it, may it bring you joy and may it inspire you!